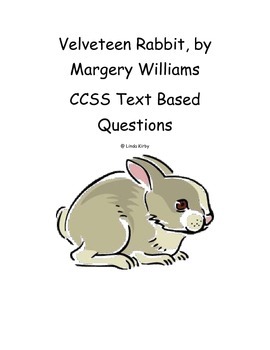 CCSS Text Based Novel Questions "Velveteen Rabbit"
Beneficial for large groups, small groups, and RTI groups. Students are responsible for writing constructed responses to the questions. Cite where I found an answer in the text. Determine meanings of vocabulary from context clues. Describe characters from text information. Your feedback is important for us and others looking at our products. Please take a few minutes and go to the "My Purchases" option. Find our product that you downloaded/bought and select "Provide Feedback". We hope that you will give us 4 stars and positive comments. Your comments help us to make our products better and it helps others see that we have great products. Don't miss out on freebies, sales & promotions, great new products, and useful tips & suggestions. "Follow" Rusty Pail on TPT. Be sure to click the green star next to "Following" (in the upper right corner of this page -- next to our logo/picture)! Don't forget to get on the Rusty Pail email list! We periodically have drawings and unannounced sales and giveaways. To join the email list, just click the following link and provide you name, grade(s) you teach, and your state.